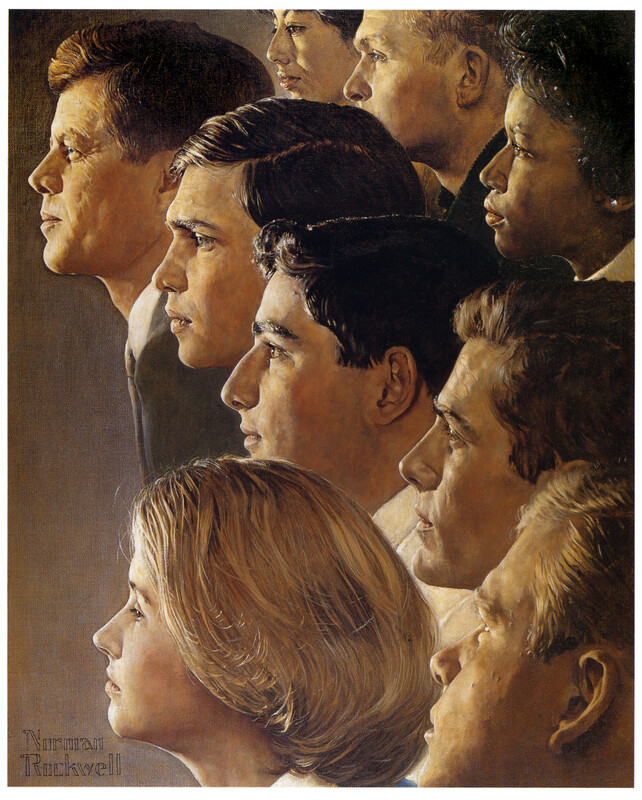 In The Norman Rockwell Album of 1961, the artist recalled his encounters with Kennedy. It was a cold, misty morning in Hyannis Port. Mr. Kennedy leaned out of an upstairs window in his pajamas and said to go right on into the house, he would be down in a minute. While Mr. Kennedy ate his breakfast, I selected a room in which to take photographs. As I posed him, I remarked that I thought a rather dignified, serious pose would be best; his youthful appearance should not be emphasized. He agreed. Afterward we walked onto to the breakwater near the house to see his sailboat. As we were returning to the house, Mr. Kennedy suggested that we try the pose again. He felt that he had been a little stiff the first time. We did, and his expression was just what I had wanted—serious, with a certain dignity, but relaxed and pleasant, not hard. Rockwell repeated the simple and powerful style used in Freedom of Worship to lend impact to this painting. Knowing his strength lay in communicating ideas and feelings through facial expressions, Rockwell chose to portray faces rather than situations to commemorate the fifth anniversary of the Corps. 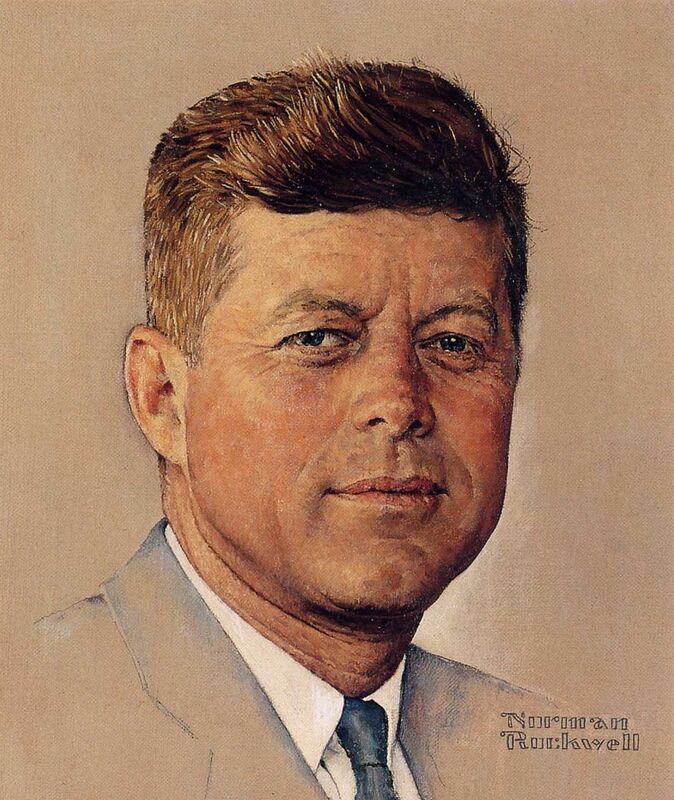 During his 1960 presidential campaign, John F. Kennedy proposed the idea of a volunteer organization of trained people who would be sent to developing nations in Africa and Asia to assist villagers in educational and agricultural projects. In 1961, the program which Kennedy hoped would promote understanding between nations was officially instated. 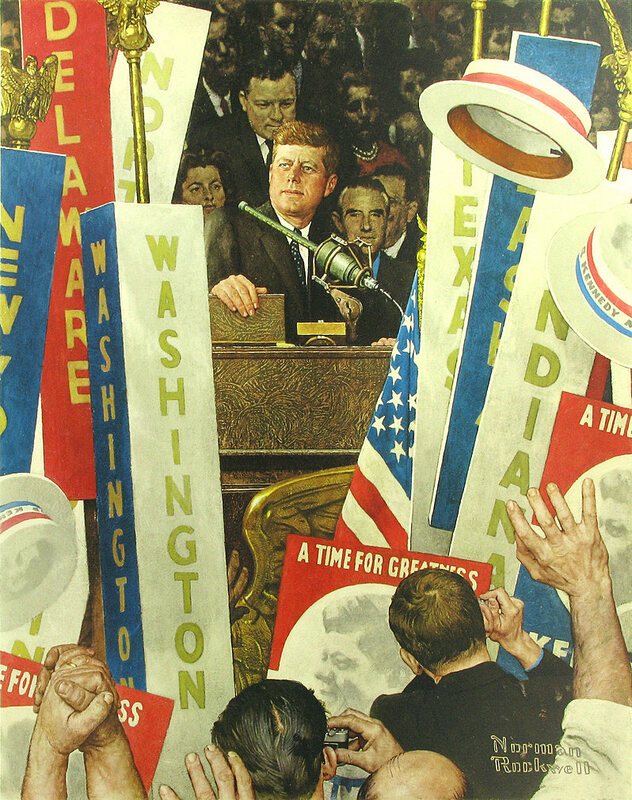 Rockwell’s portrait of Kennedy is based on a Jacques Lowe photograph from his book, The Kennedy Years. Former Peace Corps workers posed for most of the figures. “In this sordid world of power struggles, politics and national rivalries the Peace Corps seems to stand almost alone,” wrote Rockwell to art director Allen Hurlburt, when he sent the picture to Look magazine.